This classic presentation of a timeless favorite is so easy to make it almost makes itself. And once you’ve tasted the decadent flavor of my crab imperial, it will become one of your all-time favorite recipes. What Type of Crabmeat Can I Use? The source of the crabmeat can be from any part of the world that has crabs and includes varieties such as Blue Swimming, Dungeness, Snow, King and of course my favorite Blue Claw. I did score a pound of Maryland Jumbo Lump Crabmeat while shopping, and after a very much needed two-hour nap, I got up to make dinner. I admit I did have some grand plans for the crabmeat, but feeling the way I did, I decided a simpler route was in order. I admit I did have some grand plans for the crabmeat, but feeling the way I did, I decided a simpler route was in order. Usually, I make a batch of crab cakes, but for some reason, my mind went to days gone by and an old favorite, Crab Imperial. What Else Can I use Crab Imperial For? You don’t see Crab Imperial on the menu very often anymore, and it’s a shame. 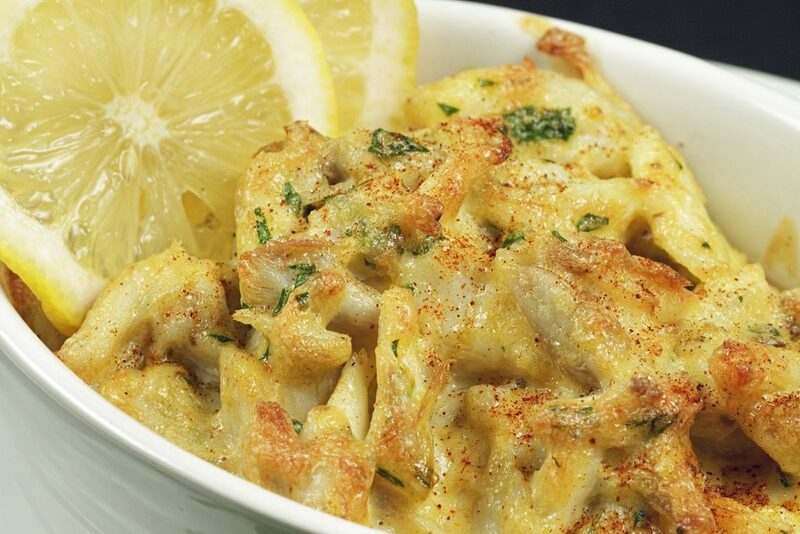 Besides being a classic dish, it’s a delicious way to serve up that lovely jumbo lump crabmeat. 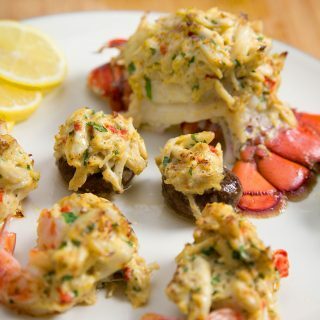 So I thought what better way to showcase this delicious crabmeat than with this timeless classic, especially since Crab Imperial is so easy to make. It also works well as stuffing for Lobster, Shrimp or Mushrooms. This was Lisa’s first time having Cab Imperial, which made the event even more memorable. We had a tomato salad with hothouse Jersey tomatoes and a loaf of artisan bread that I had picked up at a local market. I used the bread for an oh so aromatic and tasty garlic bread. A very simple dinner, but definitely the taste of summer. Bake in a 350-degree oven for 20-25 minutes (top will turn golden brown) or until a thermometer gets an internal reading of 165 degrees. This will ensure that the eggs in this recipe are fully cooked and safe to eat. 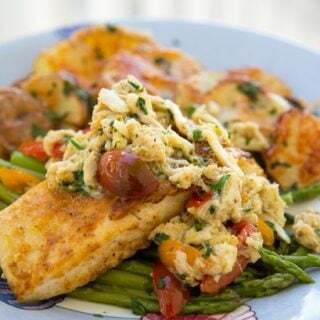 If you’re looking for an easy meal for a special occasion, or if you just want to treat yourself, do try this classic dish, you’ll be very happy you did! If you enjoyed this recipe you’ll love these! Crab Imperial is still on the menu @ Cantler’s Riverside Inn in Annapolis MD. Greatest dish – IMHO – on the menu!!! Made this recipe tonite – stupendousChef & thanks for posting the recipe!!! It blew this MD native away!!! However my baking time was nearly double the 25 mins prescribed here; could be that I cooked it all together instead of breaking it into individual portions? I’m very happy to hear you enjoyed the crab imperial. Cooking it altogether would definitely increase the cooking time, but shouldn’t have been double. Next time try it in a shallower baking dish. Oh my god this looks delicious! Chef can I make this as a side dish for a surf and turf luncheon in 1/2 cup ramekins? It sounds so rich, I think that it would go perfect as a pair with filet. Please let me know your thoughts and Thank You! you certainly can, just make little mounds of it or if you have ramekins fill those and use it as a side. It will be a perfect compliment to the filet. just watch the time you may want to reduce it my 2 or 3 minutes. Loved the simplicity of this recipe – turned out perfectly (and not because I can cook, at all). Had some leftover so the next day I added sour cream to make it creamier, stirred in some Frank’s hot sauce and topped with grated cheese – made a pretty great crab dip. Thanks for sharing this! I stumbled on n this recipe last year. I had a lb of jumbo lump and I didn’t feel like making crab cakes or crab dip. I wanted something different. One of the restaurants I frequent has great crab cakes with crab imperial sauce. So I searched crab imperial sauce and found your recipe. I decided to give it a try. My photo and review is on your “pin”. The photo looks yellow, I’m no photographer lol. I made the recipe exactly as it was written. I used 3 ramekins. It was nothing short of amazing. So tender, so flavorful. Hubby even enjoyed his and he’s not a big crab fan (the horror)! I had one ramekin left. The next day I ate it cold with crackers. It was fantastic! Just bought a lb of jumbo lump today with the intention of making it this weekend. Thank you Chef, easy recipe with wonderful results! thank you so much for the great review and comment! I’m happy that you found my recipe! I have a question. At the top of the page you state that the recipe is made with egg yolk, but when you actually give the instructions, you describe, “one egg, lightly beaten,: which implies a whole egg. That sounds like a significant difference to me. Which one is correct, whole, or yolk? I look forward to surprising my wife with this, this this weekend. Also, how old does bay have to be before it becomes old bay? lol…. I’m not sure about the old bay but as for the egg I only use the yolk in my imperial. I hope she likes the surprise! It depends on the size of the egg. I usually buy extra large farm raised and only use the yolk. If I’m using medium or large I use the whole egg. I hope you enjoy the crab imperial as much as we do Gidget! I searched for an imperial recipe and decided to try yours for its simplicity and I had all the ingredients. I am so glad I chose yours. It is absolutely delicious and my family loved it. I am making it again tonight. How do you make the imperial sause more fluffy? We used a mock hollandaise at the restaurant to make it look prettier. You can make that with 1/4 cup of mayo, 1/4 cup of melted butter and 1/4 teaspoon of lemon juice. As for more fluffy you can just add more imperial sauce to the crab, but that’s adding more filler. This recipe was a hit with my family. It was simple and delicious. Thank you for sharing. I was wondering if I wanted to make it creamier would I just add more mayo? I don’t think more mayonnaise would make it creamier, but you could try. You might achieve the results you want by just adding more of the imperial sauce to the mixture. I enjoy cooking but only have 1 or 2 daughters and myself to cook for now. I need simple easy meals to prepare now (I am 86) and all my recipes are for 10 or more people. I am having your Crab imperial for dinner Friday and can’t wait to try it. I retired to Maine recently and look forward to trying your recipes. Thank you so much!!!! Thank you for taking the time to leave a comment, Shirley. 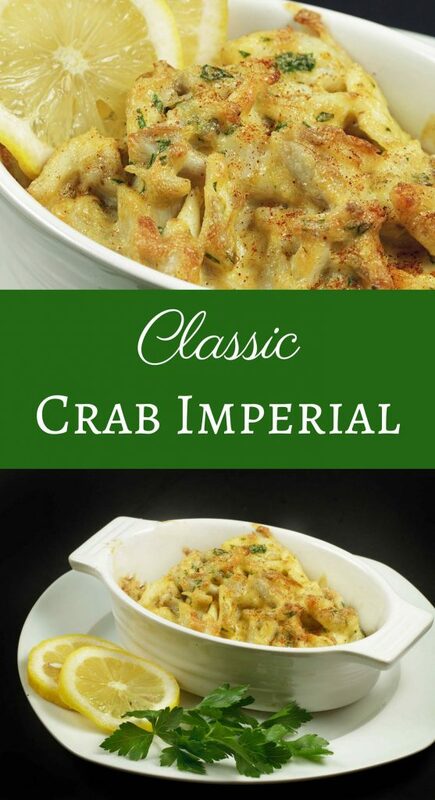 I hope you enjoy my crab imperial recipe and find many more to try out in your kitchen. OMG!!! This is so easy and so delious!! I made this and stuffed a rock fish!!! Thanks so very much!! I am looking forward to using this recipe for a special occasion I am planning to host in the near future. I’m excited to find this recipe and am making it tonight. I have two questions: Can I use canned claw meat and imitation crab in equal amounts to extend the recipe? And, what shall I serve it with? Thank you! Yes you can, any crab meat can be used. I usually serve a green vegetable and roasted potatoes but whatever you will work. This is THE recipe for an elegant meal that is easy to make. I have made it for Valentine’s Day, anniversaries and New Years Eve. It was greatly enjoyed each time. Thank you so much for this recipe! You are very welcome Maureen! Thank you for taking the time to let me know you’ve enjoyed my recipe and for the great review! Can this be frozen, then baked at a later time, or can it be stored in refrigerator before baking? Thank you for making my Christmas dinner hot app a real star! 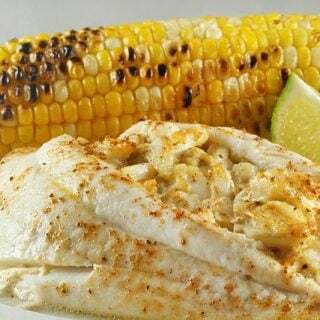 I have never cooked crab before, and needed a recipe for lump crab that I Could successfully execute for the first time Your crab imperial recipe is simple enough for any home cook, but delivers a finished meal that any crab-lover would be delighted to eat! All my foody family members thought it rocked!! Highest of fives Chef Dennis!!! I can’t really take credit for the end result because it was your excellent description and simple instructions, but you made me look like a Christmas dinner HERO! Thank you for letting me know you enjoyed my crab imperial recipe Tammy and thank you for the great review! If you’re ever looking for a show-stopping dessert try my tiramisu. Look no further, this is the recipe you want! I have a half dozen crab cookbooks and at least two or three dozen Crab Imperial recipes from which to choose. I only selected this because I just happened to have all the ingredients on hand. Lucky me. This simple recipe with easy directions is now my favorite. It’s all about the crab, it doesn’t have to be overly complicated. Chef Dennis has provided the perfect recipe for Crab Imperial, whether you are a novice or professional. I have followed this recipe exactly as presented and it is fantastic. I am using it for the third time now and will vary just a tiny bit by including a teaspoon of dijon mustard and a few capers, but just for a slight different spin for my taste. Chef Dennis, you taught me how to make a perfect Crab Imperial, Thanks! I will be checking out your other recipes! Thank you so much for such a wonderful comment! I’m happy to hear you enjoyed this classic recipe! 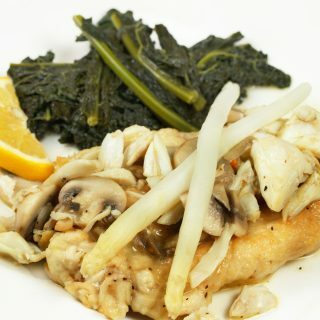 I am looking for dinner idea for lump crab and came across tbls recipe. Simple ingredients and no fuss prep. I’m planning for Sunday dinner. Its a must gotta try right off the bat. Then I started reading the comments and got real excited that this could make Christmas eve menu too. I’ll let you know. Its an easy and delicious meal for sure Arlene. You can even use the mixture to stuff shrimp, lobster or mushrooms. I am not too crafty in the kitchen, but this looks very do-able and I am looking forward to trying it. My question is: can it be made in one larger casserole dish instead of separate smaller ones? I am wondering if it is a necessity or just the traditional way to serve it. I have a small casserole dish, but nothing the size of a 8 ounce portion like I read somewhere above. yes it can be made in any size dish you like. I live in Alaska and have king crab in my freezer year around. My question is how d you know how much crab is a pound after taking out of the shell? Can’t wait to make this !! a pound of shelled crab meat will be approximated 2 cups. Let me know how they turn out. Chef this recipe sounds wonderful. I wanted to do something like this to stuff a lightly fried chicken breast. I have two questions. I am assuming I should go ahead and cook the chicken breast and the crab and Peoria separately then stuff the chicken breast with the baked crab imperial? The second question is that I love the taste of Grey Poupon and I was thinking can I add a little bit of that to the mayonnaise or will it be too much? This sounds really good to me and depending upon how you stuff the chicken it could be done all at the same time but finished in the oven. If you pound out the chicken you can stuff it and roll it, but you’ll end up with a less than flavorful chicken breast to get the stuffing cooked. 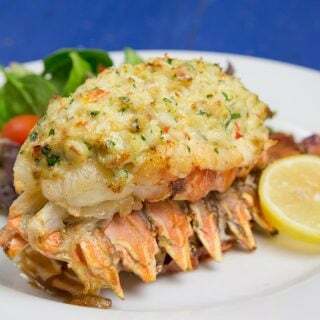 If you really want to wow your guests I would do it separately and top the fried chicken with a nice portion of baked crab imperial. Just be gentle with it when you take it off the tray and place it on top of the chicken. By all means, add a little grey poupon to the recipe it will be a nice addition to the flavors. Just keep it as a hint of the flavor. I’m happy to hear you enjoyed my recipe and I’m sure it was great with imitation crabmeat. Thank you for the great review! I hope you don’t mind the name. I’m so thankful for this recipe. The first couple times I made it, I used crab. 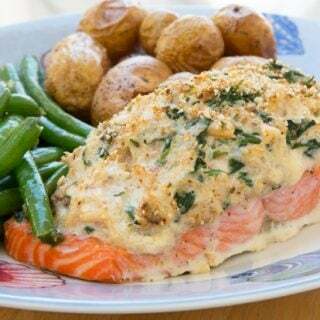 I’ve been making this recipe for some time now but I used salmon instead of crab and it worked wonderfully. I think I will be replacing the salmon with vegetables now as my body and eating habits have and are changing. Thank you so much, Chef Dennis, for sharing this awesome recipe with all of us!!! Please don’t ever take it down!!! You are very welcome and I’m thrilled to hear you tried the recipe with salmon, that is excellent! And don’t worry its definitely staying up, its one of my favorite dishes! You say to add old Bay to the other ingredients but it’s not in the actual recipe, how much should I use?? it is in the recipe, it calls for 1 tsp. Yummy. I had the ingredients and did an internet search for what I could make. I needed to make it smaller for the baking dish so measurements weren’t ‘as much’. Also, unfortunately, I only had jarred parsley instead of fresh. It tastes smooth and all the ingredients compliment each other. I will definitely use this again. I filled a small bowl and added a little cheese while it was still hot (I like cheese) and that was good too…but I will stick to your recipe when others will eat it! Thank you for letting me know you enjoyed my recipe for crab imperial. I like cheese too and it sounds like a nice addition! I am really excited to make this and need to purchase the casserole dishes. What size would be appropriate for the recipe? I am looking at a set that are 11oz each? Too big? I think the 11oz will be too big. I would look for 8 ounce dishes. I always struggle with last season’s Dungeness Crab I have stashed in the freezer! No matter how we try to seal and preserve it, the crab meat always seems to taste dry & freezer burned. NEVER AGAIN. I found my “go-to” recipe. I didn’t have Old Bay seasoning (don’t really like it anyhow) so I added a pinch of Italian seasoning, a pinch of dried parsley (because I didn’t have fresh), and added some ground garlic salt. To make it a meal I added some chopped red onion, button mushrooms and an extra egg. It turned out delicious and the leftovers will be perfect for breakfast! Thank you for sharing!!!! 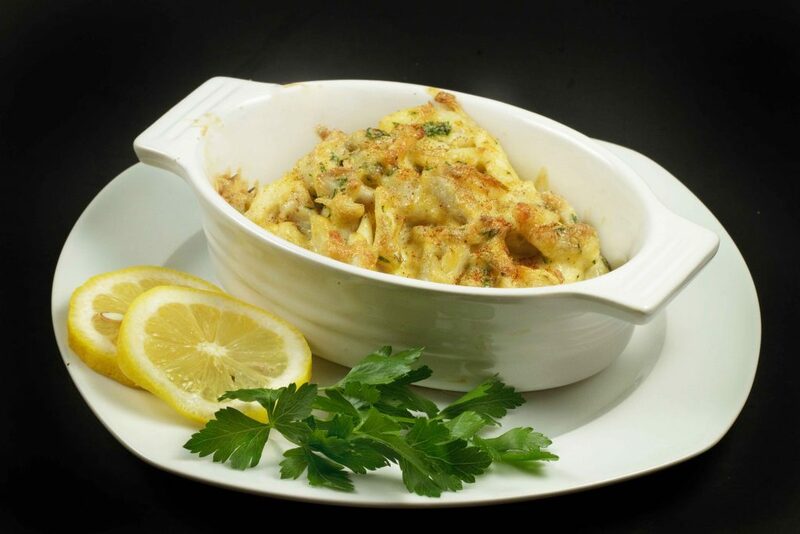 I’m happy that my recipe can help you enjoy your Dungeness crabs! As for the old bay, I’m also happy to hear you’ve made this recipe your own by changing up the seasonings. Making a recipe your own is a great way to ensure you and your family will enjoy it. Thanks for the great review and comment! This is delicious. Had no lemon, substituted lime juice and added a little grated cheddar cheese. Couldn’t have been better. Had a pound and a quarter of crab meat and used the quarter pound to make one ramekin for myself last night. Made the whole recipe tonight and ate one. Have the other four in the fridge cooling and will freeze and will vacuum seal tomorrow to share with my best friends. I live on the Oregon coast and fresh crab is at it’s very best right now. I will be making this recipe again. Have no doubt the frozen ones will be as good as fresh baked. Thanks for the letting me know you enjoyed my recipe Lois. I’ve never been to Oregon but its on my bucket list! I just want to thank you sooo much for this recipe. I lived in MD for 4 years and had Crab Imperial the first year there. I love it so much more than crab cakes. Your recipe is awesome and better even than the one I first had. It is now a yearly tradition. I make it for Christmas Eve dinner with French bread and a salad. It is delicious, quick, and easy. Thank you!!! thank you so much for letting me know you’ve been enjoying my recipe. I’m glad I could make your Christmas Eve dinners a tradition! Hi there – I live in the eastern shore area…so we go crabbing and make lots of crab dip in the summer! I’m going to make this with a steak tonight for my husband’s birthday, but just wanted to let you know that the calorie count is way off. I calculated the exact recipe and came up with 1,125 total calories, so 375 calories per serving. That’s quite different from the 614 stated! Just thought it might turn off some people if they think it’s so crazy high! thanks for the heads up, sometimes the program used for the nutritional information can be off. I ran it through the process again and came up with 407 calories. Hope you had a delicious dinner!